The New York Times recently ran a story detailing the efforts of Bush's appointees to the board of directors for the Corporation for Public Broadcasting to pressure PBS stations into airing pro-Republican programming and dissuading them from airing programming deemed to be unfavorable to the Bush administration. The job of the press is to scrutinize government, not praise it. The administration gives its story in the best possible light using taxpayer money. That must be countered by a vigorously critical free press. When have administrations, either Democratic or Republican, presented evenhanded pictures of what they do? The question isn't whether "Now" (formerly "Now With Bill Moyers") is critical of the Bush administration but whether it behaved differently during the Clinton administration. If anything, our press has failed to be critical enough. Indeed. If our press had been less gullible we might have avoided plunging headlong into this Iraqi quagmire on specious grounds with no clear idea of the consequences. Perhaps enough people may have been enlightened to the point that we could also have avoided this disastrous Bush presidency in the first place. In a column in the LA Times Jonathan Chait makes a good point on the difference between a show like NOW with Bill Moyers and the Wall Street Journal Editorial Board show now on PBS. (Kenneth)Tomlinson has chosen to balance off the documentary news program "Now" with a new program featuring punditry from conservative members of the Wall Street Journal editorial page. Tomlinson explains, " 'Now' is provocative. The Wall Street Journal program is provocative. Paired together, they create the perfect balance situation." Again, the equivalence is absurd. "Now" may tilt left in its choice of topics, but it practices real journalism: digging up facts, giving both sides their say, and so on. The Journal editorial page feels absolutely no need to constrain itself that way. Neither "Now" nor the Journal editorial page are balanced, in the same sense that neither Margaret Thatcher nor Paris Hilton are virgins. The same analogy could work to explain the difference between Tom DeLay's ethics troubles and those of various Democratic congressmen who keep being trotted out by GOP apologists as proof that "everybody does it." I understand there is an election thingee going on this weekend. And for a detailed look at the elections check out the excellent San Antonio, TX Election Information site. As for my preferences, I will be casting a vote for Phil Hardberger for Mayor, although I think Julian Castro will win big. I will also be casting a vote in support of my City Councilman Art Hall and I am resentful that he will be forced to leave office in just two more years because of San Antonio’s moronic term limits law. And I will be supporting the first two ballot initiatives and probably the third one as well. So everyone go out and do your patriotic duty and vote if you live in the city limits. 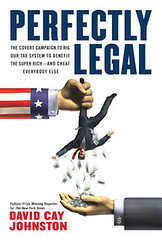 I just started reading a new book called "Perfectly Legal: The covert campaign to rig our tax system to benefit the super rich - and cheat everybody else" by David Cay Johnston, a Pulitzer Prize winning reporter for the New York Times. The Internal Revenue Service in 2003 released its first public analysis of tax returns filed by the 400 highest income Americans each year from 1992 to 2000, the years of both the Clinton administration and the stock market bubble. The minimum to make the top 400 more than tripled from $24.4 million to $86.6 million. About 2,200 different names appeared on the 3,600 tax returns that were analyzed. Only 21 taxpayers made the list each year and only a few times was an income of a billion dollars reported. In the year 2000, the top 400 taxpayers received 1.1 percent of all the income in America, more than double their 0.5 percent share in 1992. On average, their income was nearly $174 million, nearly quadruple the $46.8 million average in 1992. They paid an average of $38.6 million each in federal income taxes in 2000. That is a lot of money. However, the share of their income going to federal income taxes was another matter. It fell. Federal income taxes consumed just 22.2 cents on each dollar of thier income in 2000, down from 26.4 percent eight years earlier and a peak of 29.9 percent in 1995. The 400's tax burden was not much more in 2000 than the overall federal income tax burden of 15.3 cents on each dollar of income. And the overall effective tax rate had increased from 13 cents on the dollar in 1992. So during years when the federal income tax burden on Americans overall rose by 18 percent, it fell by 16 percent for the top 400, whose incomes soared. I may have to post more excerpts from this excellent book as I go through it. "...you may be wondering whether it's really possible that professional editorial writers at a first-rate newspaper - people who, after all, are paid to think seriously about issues like this - could make such a simple statistical mistake. Are they really so dishonest or so dumb as to think that you can measure the fairness of a tax code by looking at what share of the taxes various groups pay without considering how much they earn?" I think it is really sad that a newspaper which has such high journalistic standards for its news staff, apparently has no integrity whatsoever when it comes to its editorial writers. The disconnect between the two departments could hardly be any greater. Raunchy lyrics? First off, nobody can understand the lyrics - not even the FBI which investigated the Kingsmen for supposedly offensive behavior some 40 years ago. Secondly, the actual lyrics are not the slightest bit raunchy. Now these poor junior high band members are going to have to learn a new song before the big parade because their superintendent is an even bigger twit than your average Texas state legislator. Wyoming has a population of about 500,000 people and they have one Congressman and two U.S. Senators. The District of Columbia has a population of 575,000 people and they have no representation in either the House or the Senate. Not only do they not get a vote on matters affecting the nation as a whole, they don’t even have control over their own budget. Since they are not a state or part of a state, their budget is controlled by a Congressional committee comprised of members from other districts. No other country in the world has seen fit to disenfranchise the residents living in their capital city, but we have tolerated this situation here for 200 years. You can see a complete history of D.C. statehood efforts here. Now comes news of a bi-partisan effort to give the residents of D.C. at least some representation in Congress. U.S. Rep. Thomas Davis, R-Va., is sponsoring legislation that would add two new seats to the House of Representatives - 1 in D.C., which would be solidly Democratic, and 1 in Utah, which is heavily Republican. Under Mr. Davis's bill, the House would grow by two members to 437 after the November 2006 election. Washington would gain one seat, with the other going to the state next in line for a Congressional seat, namely Utah, which narrowly missed gaining a fourth House seat after the last reapportionment. After the 2010 Census, the House would revert to 435 members, with Washington retaining its seat and Utah most likely keeping its additional seat because of population growth. Two seats would be lost in other states. I would prefer to see D.C. get a House seat and two U.S. Senators, just like solidly Republican Wyoming, but half a glass is better than nothing at all, especially at a time when Republicans dominate every branch of government. So I would hope that Pelosi would withdraw her objections to the bill and urge Democrats to get on board with this effort. No doubt the liberal media is to blame for this. A majority of Americans do not believe it was worth going to war in Iraq, according to a national poll released Tuesday. Fifty-seven percent of those polled said they did not believe it was worth going to war, versus 41 percent who said it was, according to a CNN/USA Today/Gallup poll of 1,006 adults. If the media would just quit covering these kinds of stories and stick to feel-good stories about our troops building new schools and passing out humanitarian aid, I’m sure the poll results would have been different. Meanwhile, the chairman of the Joint Chiefs of Staff has admitted to Congress that operations in Iraq have constrained our military’s ability to tackle other potential conflicts, making any future war more likely to be longer and bloodier. Myers stated in the report that U.S. armed forces would "succeed" in any future major conflict but "may be unable to meet expectations for speed or precision." Any future armed conflicts "may result in significantly extended campaign timelines, and achieving campaign objectives may result in higher casualties and collateral damage," the report stated. Bush was asked during an April 28 news conference whether troop commitments in Iraq and Afghanistan were limiting U.S. military options elsewhere in the world. Bush responded that he asked Myers a similar question. "I say, 'Do you feel that we've limited our capacity to deal with other problems because of our troop levels in Iraq?' And the answer is, 'No,' he doesn't feel we're limited. He feels like we've got plenty of capacity," Bush told reporters. PinkDome has a picture that captures the essence of this offensive cheerleading crisis that has lately rocked the nation. Thank goodness our Texas lawmakers have stepped in to set everything right. Hopefully, displays such as that one will soon lead to fines and punishment appropriate to the crime. Seriously, though, Rep. Al Edwards’ idiotic legislation should never have made it out of committee. I haven’t seen how the votes broke down on this bill but I would bet that Republicans were the chief backers of this legislation and conveniently used Democrat Edwards as their stooge. Hopefully, the Senate will be a bit more sensible and bury this legislation before it leads to further embarrassment for our state.